Many visitors to the site ask us, “I’ve got a .223 and .308. 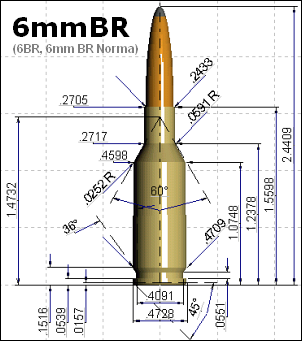 What will a 6mmBR Norma (6BR) give me that I’m not getting already?” Well first you may well average somewhat smaller groups than your current .223 or .308 rifle (assuming the 6BR has a quality barrel and trigger). A good .308 Winchester can be superbly accurate, no question about that, but the lesser recoil of the 6BR works in the shooter’s favor over a long string of fire. Even with a Rem 700 or Savage action factory action, a 6BR with a benchrest stock, premium barrel, and a high-quality chambering job should deliver 5-shot groups in the high twos to mid-threes, provided you do your job. We have one 6BR rifle that shoots Lapua factory-loaded 6BR ammunition in the low twos and high ones. That’s exceptional, we admit, but it still shows how the 6BR is an inherently accurate cartridge, even with factory loads. Share the post "Recoil Comparison — .223 Rem vs. 6mmBR vs. .308 Win"
The 1970’s called , and they want their 168gr MK’s back . Does anyone even shoot a 168gr anything in competition anymore ?